Star Trek fans are sure to remember the extremely cool moment in First Contact when Geordi uses his brand new cybernetic eyes to zoom in on a drunk, fleeing warp scientist. That cool piece of movie tech is now much more real thanks to a new pair of contact lenses that give your eyes nearly 3x zoom. Researchers at EFPL and the University of California, San Diego have developed a pair of zoom-switching contact lenses that will not only let you see as you normally do, but also let you magnify what you see by 2.8 times--this is about the same as looking through a 100-millimeter lens on a 35mm camera. The trick behind these contacts is a two-part lens. The center is simply a clear element that allows light to pass through as it normally would. 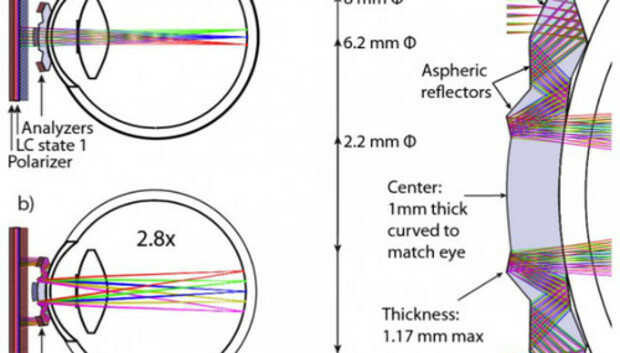 The outer edges of the lenses, however, are coated with patterned aluminum mirrors. These mirrors reflect light that passes through the lens, bouncing it around the lens four times before it hits your retina. Meanwhile, switching between normal and telescopic vision is done through a pair of Samsung liquid crystal switching 3D glasses. The center non-zooming part of the contact comes equipped with a polarizing filter, so switching between distance-viewing and regular vision is as simple as changing polarizing states on the glasses. But the biggest breakthrough with these contacts is that they're only 1.17 millimeters thick, so you can easily slip them onto your eyes. Previously, telescopic vision was only possible through telescopic glasses or by surgically implanting larger telescopic implants into your eye. Technically, scientists developed these contacts to help restore sight to people with age-related macular degeneration (AMD). AMD destroys the high-resolution central macula region of the eye's cornea, which robs you of the ability to make out fine details like words on a smartphone. If they work as designed, these telescopic lenses will to redirect and magnify the light to the outer regions of your eyes, allowing you to see these details again. That said, the research could also be used to develop contacts that help people with healthy vision to see super far. As cool as cybernetics like these would be, we're not quite there yet. Currently the telescopic contacts are made out of PMMA plastic (the same material made to use acrylic glass like Plexiglass), which is uncomfortable to wear. The researchers say that the next step is to make the contacts out of rigid gas permeable (RGP) polymers, the same material that conventional contact lenses are made from.